I attend a lot of webinars. Currently, I’d say that I’m on at least a 2-webinars-per-week pace. Now, truth be told, I cannot always sit through the entire webinar as it happens. But I do try to register for the ones that interest me, and then sign on for at least a little bit. I try to download the slides if they are made available, especially if I know that I need to drop off early. Oftentimes, I learn a great deal from them. Well, as the weeks go by, these webinars all start to slowly blend together. The companies that may have put them on may certainly love to share information freely — but I promise you, they also want to generate leads from these events. Here’s one problem though with webinars — your interaction with the company that is putting them on may be an online experience only. Perhaps you sign up for their eNewsletter while registering for the webinar, and maybe you check out their website for a bit. But if your experience with them is only over the web, that will make it harder for them to stand out in your mind among their competitors. After you complete the webinar, export a list of all the attendees. Create a simple piece of direct mail. Maybe it’s a simple Thank You note. Add a call-to-action: it could be a QR Code or a URL that is printed on the piece of mail. 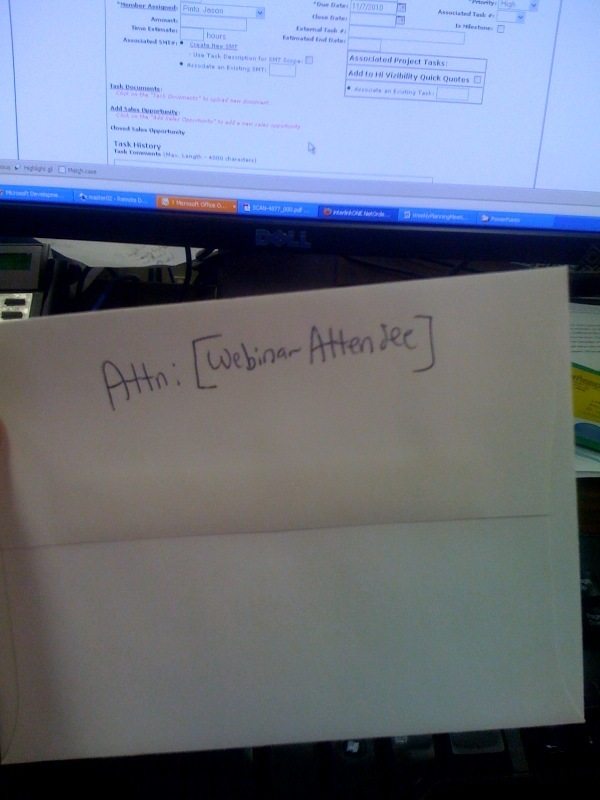 Or, you could hand-write a short URL on a sticky note and put it in the envelope. Send the piece in the mail to the attendees! Might the attendees of your webinars feel the same way about you? Um, Windows XP? I think it is time to upgrade friend. Corey, yes, you are absolutely right. I’ve had an Outlook reminder popping up on my machine for about 9 months now, telling me to do it.